Registered walkers are close to reaching the goal to raise more than $35,000 to support the SPCA’s lifesaving programs, including subsidized spay/neuter, animal medical care and humane education. 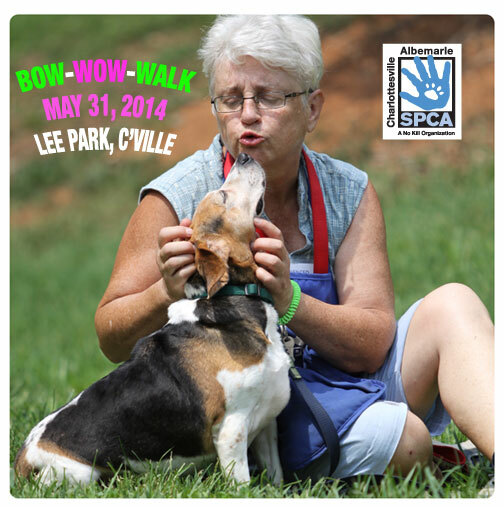 Registration is $35 and includes a commemorative T-shirt, doggie bandana and a walker goodie bag. Same day registration will begin at 9AM in Lee Park. Our generous walk sponsors include: Virginia National Bank as the Top Dog presenting sponsor; Pampered Pets and McDonalds as Struttin’ Mutt Sponsors; Doggie Do Gooders–Crutchfield, Dixon Disposal, Monticello Animal Hospital, Natural Pet Essentials, Pet Food Discounters; and the Supporting Pup Sponsors—Animal Connection, Canine Adventure, BMW of Charlottesville, Georgetown Veterinary Hospital, Mosquito Authority, Raising Canes, Virginia Animal Law Society, RKG, Darrell & King, PetSmart and Able Insurance. Special thanks to our media sponsor: NBC29, Payne Ross & Associates, and Monticello Media. For more information about the Charlottesville-Albemarle SPCA call 434-973-5959 or visit our website at http://www.caspca.org. The SPCA’s main adoption center is located at 3355 Berkmar Drive in Charlottesville and is open seven days a week from 12 PM– 6 PM.